Walt Disney World opened in 1971 with a very different footprint than it has today. Certainly a smaller one, anyway! But Walt himself said (of Disneyland) that it would never be finished but would instead be changing and growing over the years. This would naturally apply to his ‘Florida Project’ as well. So we can’t, or shouldn’t, really complain when one of our favorite rides, shows, or attractions goes M.I.A. on us. We were forewarned! But it’s OK to miss them. And what about those classics that we never got a chance to experience before they too were gone? Missed No. 5 – River Country. I’ve seen pictures of this great little Water Park just to the side of Disney’s Fort Wilderness Campground. Although it obviously didn’t have the extreme theming of a Blizzard Beach, it had a charm all of its own! I’ve often wondered why Disney decided to simply scrap it when Fort Wilderness has such awful and bland swimming pools! Why not make it a special place for FW Guests? From my dream to your ears, Mickey! Missed No. 4 – Dreamfinder. Performer Ron Schneider was the first man to take on the persona of Figments handler at EPCOT’s Imagination! Pavilion. Ron wore the purple outfit from Park opening until 1987 and enjoyed thrilling Guests with imaginative interaction 5 days a week! In its present incarnation, I could do without the Journey Into Imagination With Figment attraction. Apparently the little dragon’s goal is to capture our imagination. OK Figment, you can have it, IF… you bring back the Dreamfinder! Missed No. 3 – Fort Wilderness Train. I want more trains! Yes, I’m a steam train fan and never miss an opportunity to ride one, whether at WDW or Greenfield Village, or wherever one can be found! This great little railroad steamed along for a short time and was discontinued after a storm damaged large sections of the track. Economics and not Guest experience prevailed and we lost another classic perk at the Campground! Missed No. 2 – Discovery River. This long-gone boat ride around the river of Disney’s Animal Kingdom was an awesome idea! Just as with the Train at the Magic Kingdom, it gave a beautiful preview of the Park in a relaxing and fun way. Apparently it was discontinued because of long lines and wait times, which should have told Disney just how popular this experience was! This view… from a boat! You could see things on this boat ride that you couldn’t see anywhere else. Now that would have been worth the wait! The only thing left of this ride now is a smoking area. Missed No. 1 – The Diamond Horseshoe Revue. It all started with a two-week contract for Wally Boag and others over at The Golden Horseshoe Revue in Disneyland, but it soon whooped its way to Disney World. Thankfully we have archival photographs and video segments of this Guinness Book of Records wonder, and one TV special that never fails to get a laugh! For the Limited Time Magic promotion at Disneyland they brought back the DL version called The Golden Horseshoe Revue. Now that Billy Hill and the Hillbillies are gone, there are rumors that the Revue may move back into the Saloon. I certainly hope so! At least we still have the similar Hoop-De-Do Musical Revue over at Fort Wilderness, so the pangs of separation aren’t quite as strong for this missing show. Wow! That was a hard Top Five to write. There are so many great rides, shows, and attractions that we’ve had to say goodbye to over the years! Don’t let your favorite go unmentioned. What do you want Disney to bring back into the World? The Magic Carpets of Aladdin are our choice for #Day52 in our #DisneyWorldCountdown! Hello everyone, and thanks for taking time to stop by today as we explore the Magic Carpets of Aladdin, our choice for #Day52 in our #DisneyWorldCountdown! 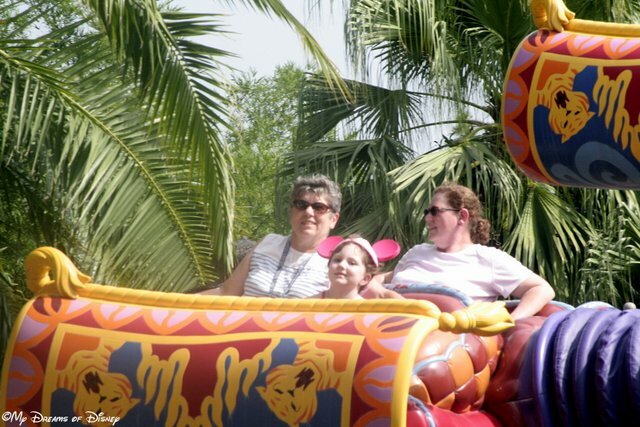 This ride is built on the mold of Dumbo the Flying Elephant, and the Triceratop Spin, and even Astro Orbiter in that you sit in a ride vehicle — in this case, a magic carpet — and you can propel yourself up or down based on the controls on the vehicle. While this isn’t an attraction that we ride every time we visit the Magic Kingdom, it certainly qualifies as one that we have enjoyed in the past, and who knows, we might even ride it this year as well! One of the things you need to keep an eye out for — whether you are going to ride it or not — is the camel that is positioned with the sign as you approach the ride. If you don’t pay attention to him, you may find yourself a little wet, so pay attention! Do you and your family enjoy the Magic Carpets of Aladdin, or do you pass this by on your way to the Enchanted Tiki Room? Let me know in the comments, and thanks for stopping by! Go out and make today and every day a great Disney Day!